It was one thing to want to establish a pipe band, but it was quite another to get the instruments and train the parish youth to play them! As in so many other situations, a little resourcefulness and community spirit came in very handy! with Jimmy Clarke visible on the second row. 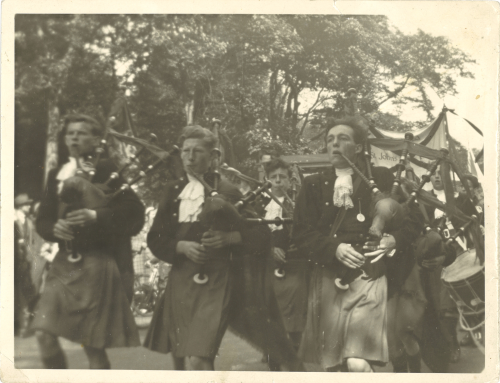 Special thanks to Betty and Pat O'Hara for the loan of the photoOnce the decision had been taken to establish a pipe band, then came the task of finding instruments and training the pipers and drummers. Resourceful to the last, Fr. Kehoe called on his contacts in Ireland and used the opportunity of a trip over the water to come back with practice chanters and begin lessons. 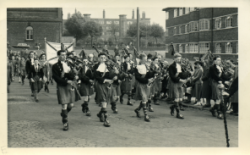 There was no shortage of young men in the parish keen to try their hand at the pipes and drums, and Father Kehoe brought in an acquaintance who had served as a piper with the Irish Guards to provide piping lessons for the young band members. Bernard Brown on the mace. Vin Meehan and Des ? ©Tom Parr. Used with kind permission (www.kevparr.com)Pat O'Hara became the Band's first ever Pipe Major and soon had the young men marching in step to the beat of the drums and, eventually, to the sound of the pipes. Pat and the boys where constantly on the lookout for instruments and accessories. 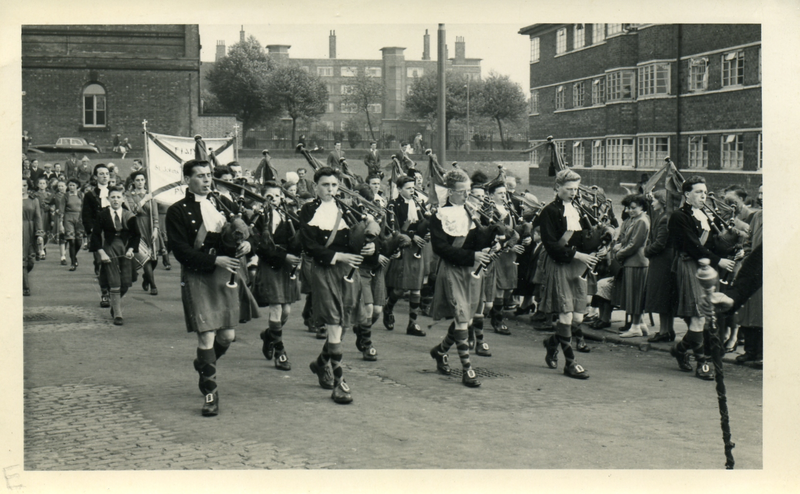 The Band's first set of pipes was donated by a retired piper who was only too happy to see his old set of pipes put to good use by the newly formed band. In keeping with St. John's tradition, the uniforms were made by ladies of the parish who were keen to play their part in the adventure. 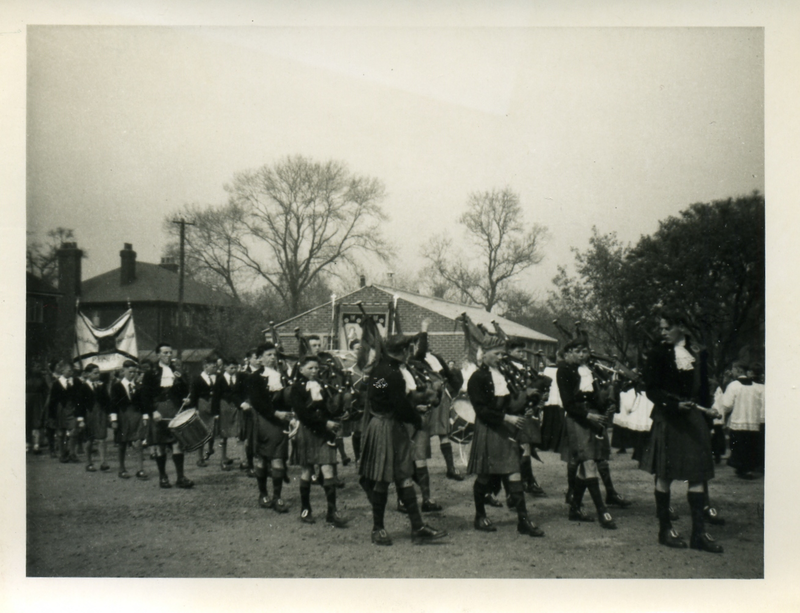 The first set of kilts was made by Kathleen Clearey, whose niece, Colette Richardson, was a member of St. John's Dancers. ©Tom Parr. Used with kind permission (www.kevparr.com)The drum corps, meanwhile, was put together by Vin Meehan, who had recently moved to St. John's from the Holy Name. Vin had been a drummer with the Holy Name Scout Band. He was given responsibility for setting up the drum corps and training the lads. In the photo opposite, Vin Meehan is playing the drum, with Bernard Mason on his left. 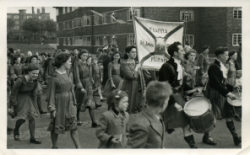 Among the dancers marching behind the Band, we have recognised Betty O'Hara (née Hussey) and May Connolly carrying the banner, with Joan Lennon (née Maguire) second from left in the foreground. ©Tom Parr. Used with kind permission (www.kevparr.com)The young men of the Parish were equal to the task and, in no time at all, Pipe Major Pat O'Hara, his brother John, Joe Gibbons, Danny McGregor and so many more were marching in front of Vin, Bernard and their colleagues in the drum corps at many a procession or community event, much to the delight of the onlookers who traditionally lined the streets in throngs at a time when pipe bands were in their heyday in the Manchester area.